Taken August 10, 2009. 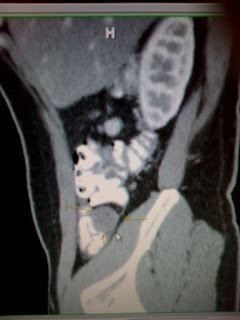 The round thing surround by the arrows was the 2.5 cm diameter thing on my appendix. The tumor was removed as part of my appendectomy and right hemicolectomy on August 31, 2009, at Froedtert/Medical College of Wisconsin. I was in the hospital for 6 days, and total in-hospital and at-home recovery time was one month.